Strange as it may sound, Hanns Eisler could be classed as the Twentieth Century equivalent of Franz Schubert; he composed around 500 songs (Schubert wrote over 600) and became known as one of the greatest composers of Lieder of that century. He also composed music for many Hollywood films after he left Germany in the late 1930s, as well as music to accompany many of the plays of Brecht, with whom he collaborated from the late 1920s until Brecht’s death in 1956. Eisler’s story mirrored that of so many composers, artists and writers who were forced to leave Europe in the late 1930s. Eisler’s father was Jewish, his politics were supportive of the German Communist Party, his brother was a member, and his sister one of its leaders. All that, coupled with his fiercely ‘left-wing’ music for songs accompanying Brecht’s words, was obviously too much for the Nazis, who after 1933 banned his music along with Brecht’s poetry, and, like so many others, Eisler ended up in the USA. It was ironic therefore that he should fall foul of its anti-left-wing purges of the 1940s, which eventually forced him to return in 1948 to a Germany very different from the one he had left. Even more ironic was the fact that his own sister had gone to America before him, and had not only shed her communist beliefs but become fiercely anti-communist to such a degree that she later testified against both her brothers, by then living and working in the USA, to the infamous House Un-American Activities Committee. 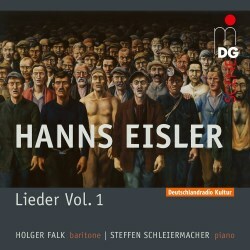 It is easy to understand why Eisler’s songs, which had the aim of unifying the working class to fight exploitation and unemployment, and later of rallying them to fight the rise of fascism, drew the hatred of the Nazis. The words are obviously key but there is a note that says translations could not be included ‘for copyright reasons’- whatever that means. Try as I might, nowhere on the Internet were they available for the same reason, which frankly makes an objective review almost impossible. Although the music is brilliant and Eisler was so able to fashion songs dripping with biting irony and a sardonic humour that so obviously gives the words extra weight, without translations it is impossible to express how bitingly effective they are. The Nazis clearly regarded them not just as criticism of the circumstances which enabled them to gain power but also as hugely influential in rallying opposition to them. The text by pianist Steffen Schleiermacher describes the background to the songs and explains many of them, giving one example of why the Nazis were so inflamed by the combination of Brecht and Eisler standing out: The Song of Hitler, the House Painter. Europe urgently needs another Brecht and another Eisler today with many of the same forces at work. Holger Falk has the perfect voice for this repertoire, with the strength to carry words that are so obviously telling, and Steffen Schleiermacher accompanies him with aplomb; they combine to lend the songs a music hall atmosphere but with an added sense of urgency. It is to be hoped that one day the copyright question will be resolved, giving non-German speakers the chance to appreciate fully the devastating power of these songs.